The EMS Nomad: Laugh of the Day: Do You Know What The Onion is? CeaseFirePA doesn't! Laugh of the Day: Do You Know What The Onion is? CeaseFirePA doesn't! 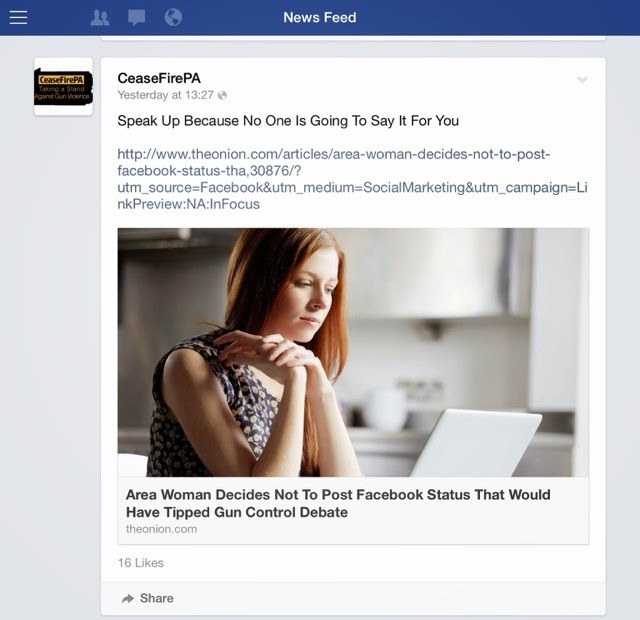 The other day, (Monday, 6/30, 16:37 EDT) anti-gun group CeaseFirePA posted a lovely link to their Facebook page. I'm assuming they shared it to their Twitter feed as well... however, I didn't get a screenshot of that. Oh, and in case you didn't guess - this misstep went down the memory hole and no longer exists on their Facebook page. I took this screenshot, though, so it's preserved for posterity.